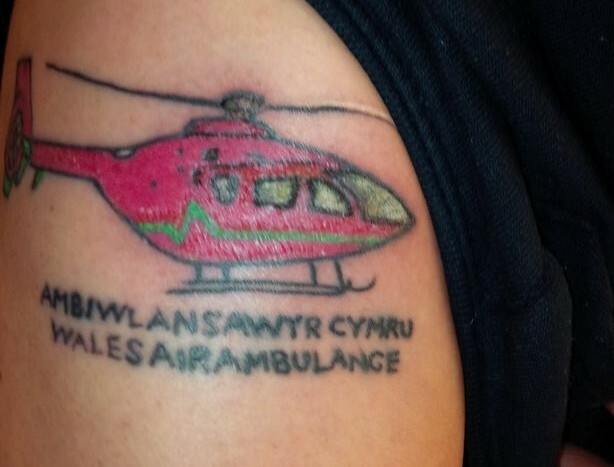 Wales Air Ambulance volunteer Peter Edwards is so dedicated to his favourite charity he’s had a replica helicopter tattooed on his arm. Peter has been volunteering with Wales Air Ambulance for more than three years, where he helps out in their Wrexham charity shop. Not satisfied with simply spending his days working for the charity, the dedicated volunteer has had the famous red helicopter representing the charity’s logo tattooed onto his right arm just below his shoulder.